The Imperial Fists Primarch-Progenitor, to your glory and the glory of him on earth! First of all, sorry for being away so long. I've been busy with family stuff. Stay tuned for an update on DIPPED Imperial Fist Terminators. Ok, on with the review. I got to see the film on Saturday at the theater with a bunch of fellow geeks at one of the Special Screenings. There are a few mild spoilers in this review so just be warned. I tried to leave out any specifics that were not pertinent to the review. This review is written from the point of view of an Imperial Fists player. I had fun and enjoyed myself. I see no reason not to support independent film makers (especially ones that went out on a limb to make a movie that was never going to see broad distribution to a niche market). As a fan of 40K I give it 4 of 5 stars… it’s the coolest thing ever… but as an objective movie going person not familiar with the IP prolly only 2. It’s an average film. - True to the universe. This movie was clearly made by guys that know 40K and know what's going on. It was made by "our kind" and it's for "our kind." - Conceptual graphic design. The planet, "fortress," weapons, armor, the stained glass windows, the design of the chaplain's armor and helmet, the servitors, and bits and gubbinz were outstanding. - Voice acting. I really enjoyed it. They went out on a limb to get professionals and it shows through. - Ultramarines as Characters. This is actually heavily tied to the voice acting, but I thought the characters were well executed. They were believable as faithful, rock hard veterans of many battles against the foes of the Imperium and as super-soldiers. - The plot. I think Dan Abnett dialed this one in. It's acceptable. It's a simple premise and I'm sure that kept it easy to animate and the costs down but... it just felt like Dan really didn't put a lot of effort into it. - Graphics. There seems to be no middle ground here with most people. You either love them or hate them. Here's what I think... a bunch of gamer geeks like you and me took out loans and went into debt to make a feature length 40K movie. They did the best they could with money they had. They not only had to pay for animation (and hardware) but also voice acting, creation of the movies, advertising, and self-distribution. Considering the uphill battle they were fighting... I give the graphics a 5 for 5. Objectively examining the graphics as a work of art compared to what multi-million/billion dollar software companies can do... maybe a 2 (of five). It ain’t Dawn of War cutscene/cinematic quality… but they aren’t THQ/Relic Entertainment either. - Pacing and Editing. Realize I want these guys to do well and I'm a fanboy... but I can't even sugar coat this. The pacing and editing sucked. I realize that they were running low on money to make this movie and a "loop" is easy to animate and cheap. But there was WAY too much walking around with NOTHING going on. It drags on for-bloody-ever until they finally get to the "point." It's an action movie guys. If you want to "cheat" and do loops from different angles to save rendering time... loop COMBAT scenes and not WALKING scenes. - Ultramarines as Cliché – If I had to hear “We March for Macragge and We Shall Know No Fear” one more time I was going to put a bolter round through the screen myself. Never fear my yellow clad battle brothers. There is nothing in this film that will make you any less proud of your chosen chapter. 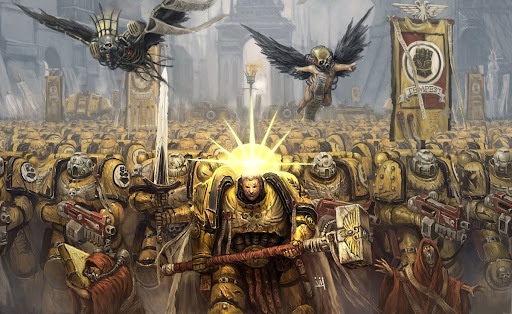 We are used as the “kill the bad@$$3$ early on to show the audience that the situation is serious” plot gimmick, but the Fifth Company died with honor and glory serving the Emperor of Mankind. A completely unofficial fan-made blog. Adeptus Astartes, Blood Angels, Bloodquest, Cadian, Catachan, the Chaos devices, Cityfight, the Chaos logo, Citadel, Citadel Device, Codex, Daemonhunters, Dark Angels, Dark Eldar, 'Eavy Metal, Eldar, Eldar symbol devices, Eye of Terror, Fire Warrior, Forge World, Games Workshop, Games Workshop logo, Genestealer, Golden Demon, Gorkamorka, Great Unclean One, Inquisitor, the Inquisitor logo, the Inquisitor device, Inquisitor:Conspiracies, Keeper of Secrets, Khorne, Kroot, Lord of Change, Necron, Nurgle, Ork, Ork skull devices, Sisters of Battle, Slaanesh, Space Hulk, Space Marine, Space Marine chapters, Space Marine chapter logos, Tau, the Tau caste designations, Tyranid, Tyrannid, Tzeentch, Ultramarines, Warhammer, Warhammer 40k Device, White Dwarf, the White Dwarf logo, and all associated marks, names, races, race insignia, characters, vehicles, locations, units, illustrations and images from the Warhammer 40,000 universe are either ®, TM and/or © Copyright Games Workshop Ltd 2000-2010, variably registered in the UK and other countries around the world. Used without permission. No challenge to their status intended. All Rights Reserved to their respective owners.